Travelling from Unst to Sumburgh is a matter of negotiating single-track roads, a few ferries, and the odd sheep that wanders in front of your vehicle. This is the scale of the job facing Shetland's library van. 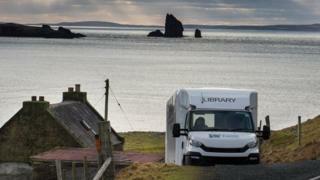 Once a month, the van visits a different area of Shetland to deliver and collect borrowed books. As well as providing reading materials for their customers, some of the van drivers go above and beyond the literary call of duty. One of the drivers, Annette Shewan, said the van can act as a "lifeline" for its remote customers. Ms Shewan has covered every inch of Shetland over the past 20 years and has got to know her customers well. She says she sees some of them more than her own relatives. A closeness can develop between the van driver and the customers, she says, and "you actually make good friends and get to know people really well". "You even become a small part of their lives," says Annette. Being part of someone's life can mean seeing them at their happiest and their most vulnerable, she says. Ms Shewan has seen her customers becoming parents, changing careers, "or losing their partner". "Over 20 years you can come across just about everything," she says. Annette has seen change in people's lives - from the highs of new children or grandchildren to the lows of job losses. But she has found that the library van remains constant for her customers. In particular, people's reading habits tend to remain the same over time. "I've found if people read crime books, they carry on reading crime books. [Despite changes in their life] you don't see a great change in what they read." When "out on the road" as Ms Shewan puts it, you can be greeted by all manner of sights. Her job of driving, navigating, and recommending books is only part of what she does. Shetland Library van drivers have to be prepared for a variety of circumstances. This is another way the van and its drivers can act as a lifeline for communities. On a few occasions, Ms Shewan has had to pull the van over so she could "climb over a fence and put a few sheep upright" as a sheep on its back cannot get back on its own feet and is vulnerable to attack from birds. Besides being a protector of sheep, the van drivers can get roped into some DIY. As Ms Shewan says: "I did find an 80-year old on a stool once trying to put in a light bulb." Sensing the potential danger, she "intervened" and put the light bulb in herself. Some customers are physically incapable of managing some day-to-day tasks. "I did have one lady many years ago who would get me to carry in her peat bucket every time I came," says Annette. She adds: "Her sons would fill it, but it was too big for her to carry in, and she needed the peat for the fire. "Anybody that called along got commandeered to carry in the peat bucket, the postman, the library van, whoever." In her career, Ms Shewan has delivered thousands of books across the islands. Sometimes the single-track route with tight bends across the islands can be the van's undoing - as the Twitter photograph above shows. Because of people's location or situation, travelling to and from Lerwick for books is not always an easy option. As Annette points out, the service is "necessary" and "very much appreciated". The books, as Annette highlighted, are a constant in many people's lives and Shetland Library manages to provide this vital service directly to people who cannot leave home. As Ms Shewan says: "Those people wouldn't be able to get books any other way."